The book begins with coverage of basic tools and topics within survey analysis such as simple and stratified sampling, cluster sampling, linear regression, and categorical data regression. Subsequent chapters delve into more technical aspects of complex survey analysis, including post-stratification, two-phase sampling, missing data, and causal inference. Throughout the book, an emphasis is placed on graphics, regression modeling, and two-phase designs. In addition, the author supplies a unique discussion of epidemiological two-phase designs as well as probability-weighting for causal inference. All of the book's examples and figures are generated using R, and a related Web site provides the R code that allows readers to reproduce the presented content. Each chapter concludes with exercises that vary in level of complexity, and detailed appendices outline additional mathematical and computational descriptions to assist readers with comparing results from various software systems. Complex Surveys is an excellent book for courses on sampling and complex surveys at the upper-undergraduate and graduate levels. It is also a practical reference guide for applied statisticians and practitioners in the social and health sciences who use statistics in their everyday work. THOMAS LUMLEY, PHD, is Associate Professor of Biostatistics at the University of Washington. He has published numerous journal articles in his areas of research interest, which include regression modeling, clinical trials, statistical computing, and survey research. 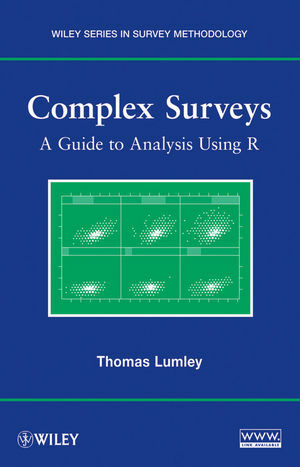 Dr. Lumley created the survey package that currently accompanies the R software package, and he is also coauthor of Biostatistics: A Methodology for the Health Sciences, Second Edition, published by Wiley. 3.1.2 Single-Stage and Multistage Designs. 3.2.2 How Good is the Single-State Approximation? 5.2.1 The Least-Squares Slope as an Estimated Population. 7 Post-Stratification, Raking and Calibration. 7.6 Selecting Auxiliary Variables for Non-Response. 8.3.1 Simulations: Efficiency of the Design-Based Estimator. 8.4.2 Two-Phase Case-Control Designs in R.
8.4.4 Case-Cohort Designs in R.
8.5.3 Some History of the Two-Phase Calibration Estimator. 9.2 Two-Phase Estimation for Missing Data. 9.2.1 Calibration for Item Non-Response. Appendix D: Database-Backed Design Objects.